RC Helicopters can cause serious injury, even death. I don’t want to scare you away from the hobby, but these machines can cause serious injury and have been known to kill people, I’ve heard of two RC helicopter deaths worldwide and a similar number in relation to RC aircraft. Like I said I don’t want to scare you away from the hobby but I’d rather you know the dangers and practise good safety rather than hide these facts. Such incidents are extremely rare and PRCHC has a 100% injury free record. The clubs safety document contains important information to ensure we operated our models safely. All new members are presented with a copy when they join and it’s important to revisit it every now and then to remind yourself of the rules for safety. Below are some safety related links which you can benefit from investigating further. To ensure safety, the field is laid out to maintain distance between operating helicopters, pilots, and the public. 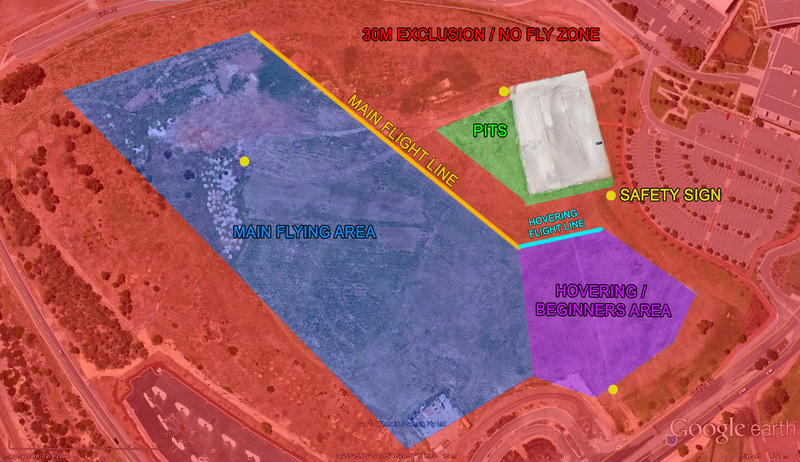 Currently the specific layout is under review so please discuss with members at the field where exactly you are allowed to fly etc. Members of the public are invited to browse the pits area. Only MAAA members can leave the pits and approach the flight line. More than one pilot can fly at a time. For safety reasons it is encouraged only the pilot and perhaps one other member approach the flight line for any one flight (i.e. don’t have 5 people standing beside the pilot during flight). Flying is only allowed during our permitted flying times, please ensure you are up to date on these, if not email the club secretary or safety officer. We place signs around the field to alert members of the public to the dangers. The idea is to place a sign at the main pedestrian access points. Without the signs out there can be no flying. The signs do not prohibit public from walking across the field, so if someone does walk across the field, ground your helicopter immediately and ensure that you are able to maintain a minimum 30m distance between your operating helicopter and them. To find out where the signs are stored speak to the guys down the field on Sunday or email a member of the committee. Safety is everyone’s responsibility. If you see something that looks unsafe it’s your responsibility to correct it. For example pointing out safety issues to the new members or members of the public visiting or crossing the field. The last thing we want is an accident. If you are unsure, please view the clubs safety document. You would have received one when you first joined up. 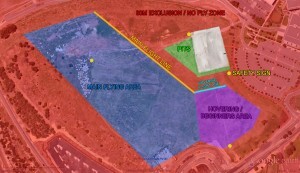 This newer picture should explain the field layout and safety sign positions.